Chauffeur Austral provides a tailor-made car-hire service with driver round the clock 7 days a week. Drivers are Grande Remise license holders, and are discreet, courteous and always available. A range of services is on offer: car-hire by the hour, half-day or day. Discovery of the island through a programme of day-long excursions, including to the Sud Sauvage (Wild South), Bébour-Bélouve Forest, Trou de Fer, the Volcano, and the Cirques of Cilaos and Salazie. Half-day excursions include Maïdo, Saint-Paul, and Saint-Leu. 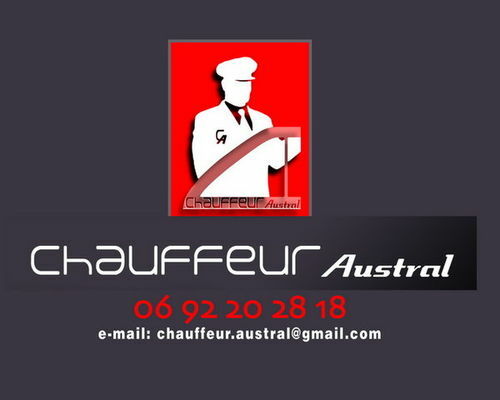 Chauffeur Austral also takes care of transfers to and from the airport with reception at the arrivals gate. Personalised welcome and luggage taken charge of up to departure point. Cars for hire are large, very comfortable Picasso C4s, seating a maximum of 6 passengers. For other car-hire requests and services, ask the manager. Rates include car, driver and service requested.